Archaeological reconstruction, the writing of history, and the arbitrary value of objects—these are big ideas in Ruby Sky Stiler’s first solo exhibition, High and Low Relief. While some artists might treat such subjects with a heavy hand, she approaches them with wit and lightness, especially through the use of foamcore in her sculptures. 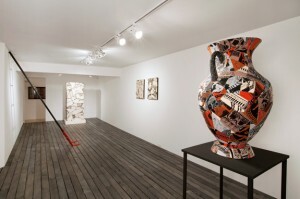 To piece together an amphora, An Earlier Vessel (all works 2009), she covers shards of the material with cartoonlike drawings on colored paper that depict elements from Greek vase painting—warriors, chariots, horses, maidens, and decorative patterning—in mock classical styles (with red and black figures), as well as invented ones. Hot-glued in a haphazard fashion, this slapdash restoration confounds any clear narrative and playfully critiques how conclusions drawn from incomplete archaeological evidence often turn out wrong. 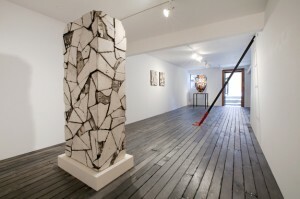 The jagged fragments in two wall works, High and Low Relief and Handle with Care, and in a five-foot stele, No Legend, are more tightly constructed and highly illusionistic, with a coating of pigment and acrylic resin on the foam board’s white surface that transforms the flimsy material into something resembling marble. The “stone” looks authentic from afar, but up close the blank plates and carved faces, patterns, and words resemble leftover props from a movie set—another source of fictionalized history. Long wooden planks—stained a smoky black and installed throughout the gallery about six inches above the floor—give a cramped feel to a room with already low ceilings, but the work, titled Attic, doesn’t transform the space quite enough to effectively question the value a gallery or museum grants objects that might otherwise be relegated to, and forgotten in, a dark, dusty garret. 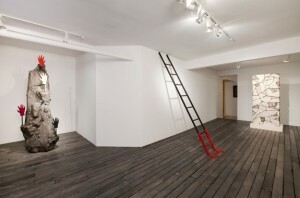 The inclusion of two lighthearted sculptures—a ladder and a faux rock, both amusingly decorated with colored wool-felt gloves that invoke department-store window displays—also detracts from Stiler’s stronger, weightier ideas about historical and cultural worth found in the other works, which treat the past as something continuously rewritten and rebuilt, never set in stone. 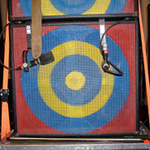 Originally published at Artforum.com on May 25, 2009.